Video game publisher Electronic Arts announced on Thursday the launch of Origin for Mac, a new built-for-platform version of EA's video game download service that will bring some of the company's biggest titles to Apple desktops and laptops. The arrival of Origin on the Mac means that Apple computer users will now have an all-in-one access point for titles such as The Sims 3, Dragon Age 2, Batman: Arkham City, and LEGO Harry Potter. "Origin is going to allow us," says EA Origin Vice President of Production Mike Blank, "to get games into the hands of our consumers as quickly as we can, to enable our gamers to connect with their friends and to enjoy their gaming experience as quickly and directly as possible." The new Mac-centric service, which has been in public alpha since January, will give users a persistent user account, allowing them to download cross-platform games on multiple machines, with purchases and in-game progress saved to their accounts. "Part of the goal of Origin is to provide real value to our gamers," Blank said. "With key titles from The Sims franchise and its expansion packs, if you download it once, you can download it again across both platforms." Origin for Mac will join similar versions for both PC and iOS, which between them have about 40 million active accounts. Blank told AppleInsider that Origin on iOS makes up a considerable portion of that figure. "Around 40 percent, maybe, about 17 million users have entered into Origin for the first time on iOS," he explained. "Wherever they're entering from, though, they're creating an Origin ID that will work across platforms." Asked about the reasoning behind bringing Origin to the Mac — a platform historically seen as a second class citizen when it comes to gaming — Blank said the Mac's gradually increasing market share, as well as a vocal community of Mac gamers, drove the decision. "We're seeing increased activity from our Mac gamers," he said. "In the past, we've brought games slower to market for Mac than for PC partly because the audience hasn't been at the same level. The growth of iOS and Mac devices, though, means we're starting to see gamers demand to play their games on devices that are becoming more prominent. I think, across the board, developers have focused on the PC platform, but I think you're going to start seeing some changes there. [Origin] is the first step in a strategy you're going to start seeing coming out of EA." Origin for Mac is available to download at EA's website. It requires a Mac with an Intel Core 2 Duo processor running OS X 10.6.8 or higher. 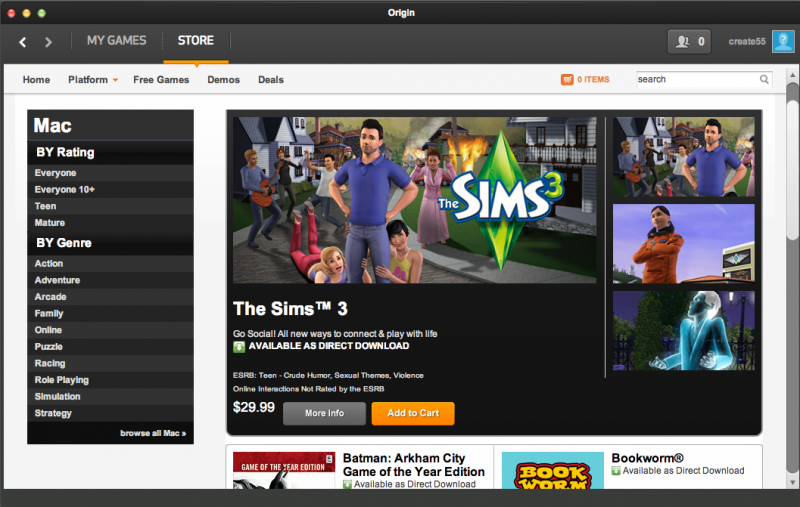 A Mac client for EA's digital distribution platform Origin was launched today, as first noted by AppleInsider. Origin for Mac was originally announced in August 2011 and went into alpha testing in late January. Origin is quite similar to Valve's Steam and allows users to download games and demos, chat with friends and continue saved games from most computers. The store currently lists 48 Mac games available for download, including games like Batman: Arkham City Game of the Year Edition, LEGO Batman, Harry Potter and Star Wars, Tropico 3: Gold Edition and The Sims 3 and its plethora of expansion packs. The new SimCity is supposed to launch a little after the March release of the PC version of the game. EA Origin Vice President of Production Mike Blank told AppleInsider that EA brought Origin to Mac because of two reasons: growing Mac marketshare and a vocal community of Mac gamers. Origin client for Mac is available as a download for free at EA's Origin website. It requires OS X 10.6.8 or higher and an Intel Core 2 Duo Processor.